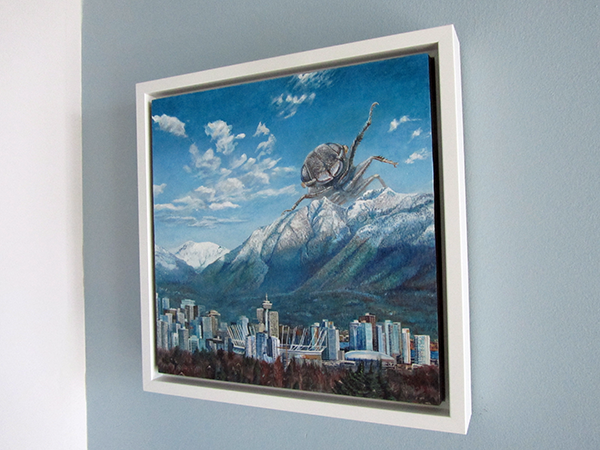 The inspiration for this painting came from a book by Andrew Nikiforuk called Empire of the Beetle. It is a fantastic book that passionately describes the way an insect, smaller than a grain of rice, has decimated forests from Alaska all the way to southern California. It draws on interviews from foresters, rural residents and scientists about the impact that the loss of the forest has caused, as well as the ways that humans have enabled the rampage by inhibiting fire and encouraging clear cutting. There is a battle being fought, the Will of Nature vs the Resolve of People, in the forests of BC. I had so much curiosity about the pine beetle after that book, I headed down to the Museum of Biodiversity to admire them for myself. It is heartbreaking to read about the devastation of the boreal forests, but I had to stand in awe of these tiny insects, who have rode the wave of misguided science, out-of-control logging, bad public policy, and a hundred years of fire suppression to feast on a bugs banquet. The beetles are doing what natural forest fires should have done, and now we have decimation on a massive scale. In their wake, we find grieving landowners, humbled scientists, hungry animals, and altered watersheds. Most interesting to me was the lack of understanding about how these insects communicate, and the way they travel together in swarms so large, they have showed up in radar at airports. The amount of biomass of beetles flying through the air over the past 20 years, would be like seeing 300,000 killer whales in the sky! A beetle epidemic of this size is like trying to stop an avalanche or a tidal wave. 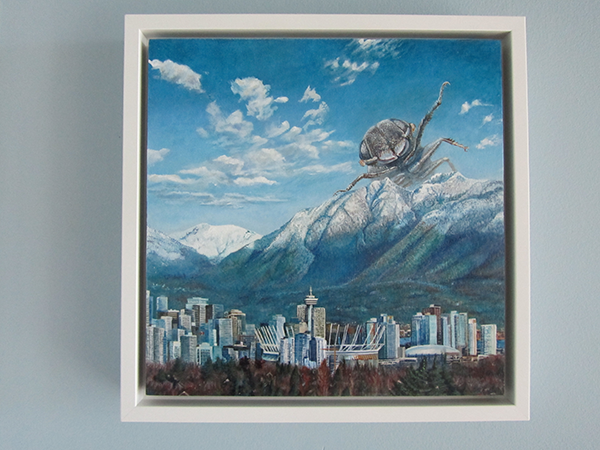 The epidemic of pine beetles has begun to find its way into culture. David Dunn has recorded the "music" of the bark beetle, which it creates by scratching body parts inside the tree to communicate with each other. When flying, they let off chemical scents to give direction to the horde. Led by a female beetle, she sends a signal to the mass of flying beetles to swarm the oldest and most vulnerable tree in an area. Highly refined communication, using sound, scent, and strength- our culture is obsessed with aliens and with finding new life "out there"- we are surrounded by alien life we don't understand and we are completely unaware of the sophistication of their world. 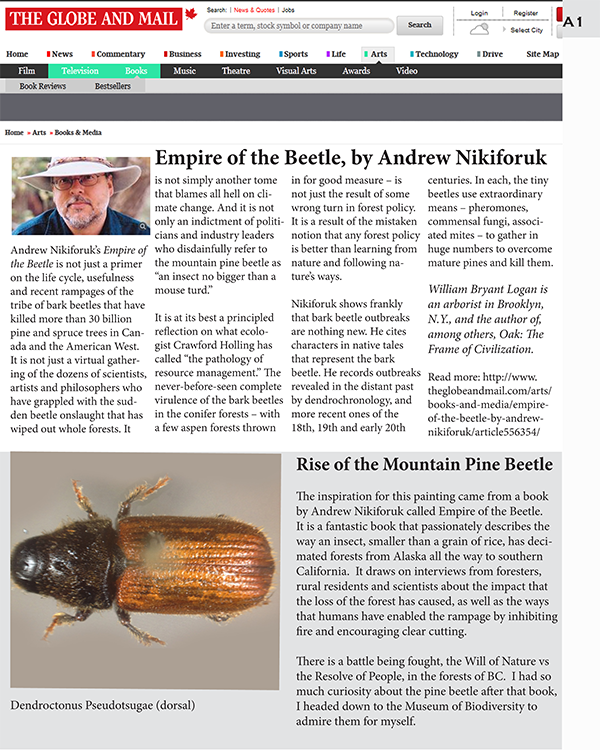 The pine beetle epidemic is an issue taking place outside of cities. Urbanization and lack of discussion about nature lead to an ignorance about what is happening outside of the city. Rural issues are quickly becoming urban issues. A third of all life on earth are beetles- they are so essential to the function of our planet and by watching the behavior of these beetles, we may take heed of what is happening in our environment. 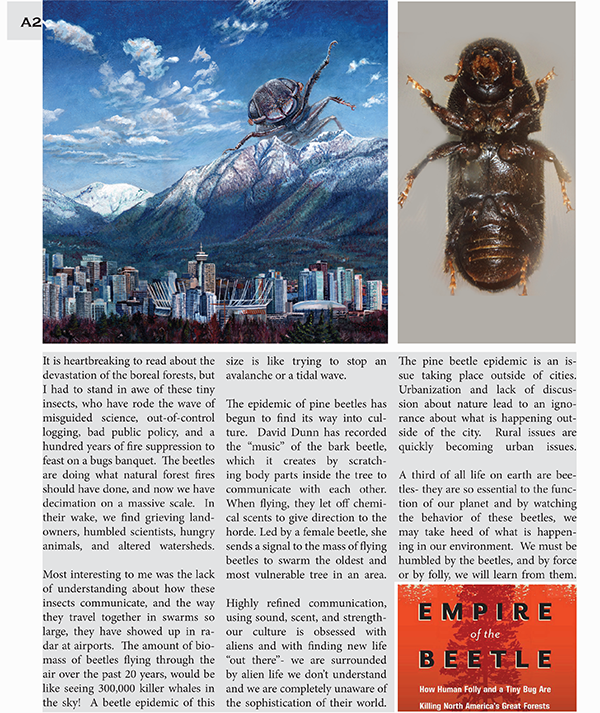 We must be humbled by the beetles, and by force or by folly, we will learn from them.